Internet explorer password restoration tool restores missing FTP client passwords hidden behind asterisk (***) or any other special character (#$%). Windows application password retrieval software retrieves passwords of all email accounts including yahoo, hotmail and gmail etc. Internet explorer password unmask utility supports all major versions of internet explorer and allows users to save recovered password list at specific location. ...... Software enables you to recover all FTP client passwords hidden behind asterisk. Internet explorer password unmask tool runs on various Windows operating system including Windows XP and Vista etc. Internet explorer password restoration software provides graphical user interface (GUI) with inbuilt help manual which assists technical as well as non technical users in operating the software. Software recovers password from all major versions of internet explorer and creates a text file of recovered passwords. Internet explorer password unmask tool restores all IE saved passwords including FTP, auto form and auto complete field etc. IE email account password recovery utility successfully recovers password of any internet explorer and other password protected windows application. 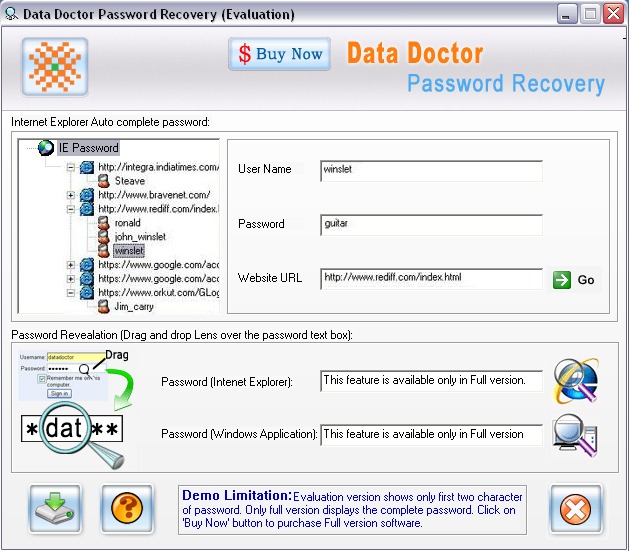 * IE lost password recovery software saves all recovered identity passwords in a text file at user specified location. Qweas is providing links to Unmask Internet Explorer Password 3.0.1.5 as a courtesy, and makes no representations regarding Unmask Internet Explorer Password or any other applications or any information related thereto. Any questions, complaints or claims regarding this application Unmask Internet Explorer Password 3.0.1.5 must be directed to the appropriate software vendor. You may click the publisher link of Unmask Internet Explorer Password on the top of this page to get more details about the vendor.